Samsung just announced its first smart speaker with Bixby and it has called it, drum roll, the Samsung Galaxy Home. It's been built to compete against the likes of the Amazon Echo, Apple HomePod and Google Home. The company announced the Samsung Galaxy Home at its Unpacked event in New York, alongside the Galaxy Watch and Galaxy Note 9 devices. The Samsung Galaxy Home speaker doesn’t have a release date and price, but we did to see, touch, and hold the new Bixby-powered smart speaker. The last one we got yelled at for, but it’s all worth it for a literal hands-on. The company said it will be showing a lot more about the technology behind it at the Samsung Developer Conference. It’s encased in a black, texturized speaker cover and sports a peculiar shape, like the bulb of a flower resting on three silver pegs that act as a stand. It’s heavy, so, no, it isn’t as easy to tip over as it looks. There are light up controls, but the demo units weren't working despite the AKG logo lighting up - and there’s a circular ring that flashes around the perimeter of the top of the speaker. Whether the company plans to launch some extra colors for the device remains to be seen, as it's just the subtle gray that we saw as it swooshed in front of us on a table being cleared away. There's an illuminated AKG logo, and the ring around it will light up when in action. We couldn’t move the Galaxy Home speaker too far. It’s tethered by a power cable, just like the HomePod. In fact, it looks and appears to function exactly like Apple’s Siri speaker, only set on a metal stand. From the demo on stage it seems that there are more than a few similarities with the HomePod - with Spotify taking the place of Apple Music, so this speaker is all about sound quality with a huge library of music behind it. The SoundSteer feature, that will direct the sound at the person speaking, is a definite advantage over Apple's model, but this is a way of listening to music when on your own rather than in a big group of people with audio that fills your home. We're yet to find out the price, as mentioned, but by the feel of the unit we can imagine it'll command a pretty hefty premium. 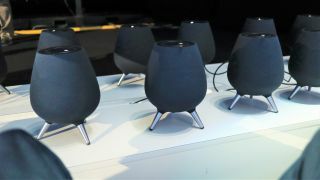 Not much is known about the audio quality on the Samsung Galaxy Home, but it looks to be a major focus of the product. Think more Apple HomePod than Amazon Echo Dot. It's powered by Harman's AKG audio, which is something Samsung bought to leverage in this speaker. On stage, Samsung claimed it will "make music sound amazing", and we can't wait to test it out to see if that's true. We know it'll have eight microphones to hear you for far-field voice recognition, so you can speak to it wherever you are in the room. The sound quality and smarts will have to wait for another day though, as these features weren’t available to test. Samsung has announced a special partnership with Spotify to help you seamlessly switch from one device to another. This works through the Samsung Smart Things app and allows you to walk into your home listening to Spotify on your Samsung phone and automatically connect it to your speaker, smart TV or even fridge (if Samsung sticks a speaker on there) the second you walk into the room. It's hard to say anything about Samsung's new smart speaker, mostly because they wouldn't let us check it out properly. We can't do our usual in-depth hands on review of the device, as we couldn't hear it in action or try out the smart elements - so it's basically judging a powered-down unit (albeit one with the lights on). We're looking forward to trying out more of the features soon though - there's a lot to pick through here as Samsung feels a bit late to the smart speaker game... but will this premium-feeling device help it make up ground?